My One And Only Unforgettable Encounter With John Lennon – Imagine That! After the “English Invasion” of the U.S. in 1964, at the urging of my friends, Paul Simon and Jackie DeShannon, I decided to go to London to promote my songs and productions. Bess Coleman, one of the Beatles press officers, with whom I was writing songs , brought me into the groups inner circle and I traveled with them on several stops of their, “Beatles For Sale” promotional tour. Backstage at a venue in White City, George and Paul were playing guitar and singing to relax in with a handful of their old mates and confidantes. Bess introduced me to them, and just as Paul smiled and handed me the guitar for me to take a turn…John majestically strode into the room. Bess introduced me to him as the American who wrote the recent top ten UK hit by Helen Shapiro, “Queen For Tonight” (Raleigh/ Wayne) John, with a wide grin, shook my hand and in a deep voice sang a parody of my song, ” I am a Queen For Tonight…but will I be a King tomorrow?”…which had the room in hysterics! Unfortunately, I didn’t know they were laughing at John, who was poking fun at the husky voiced 16 year old Shapiro’s sexuality, which had recently been questioned by the press…I thought they were laughing at me! I was embarrassed, but managed a smile as I passed on playing one of my songs and handed the guitar over to John, who sat down and sang, ” I’m A Loser”. Although that was my only personal encounter with John Lennon, it wasn’t the only connection I had. The first was in 1968, when I found a song, “John You Went Too Far This Time”, a reaction to the John and Yoko naked “Two Virgins” album cover, recorded by Sissy Spacek, whom I discovered and renamed “Rainbo”. 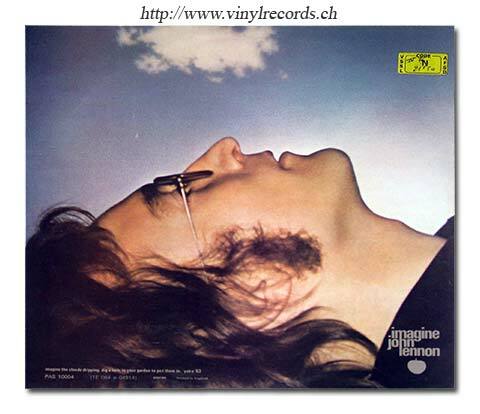 The second was concerning the original artwork of “Clouds” used on the “Imagine” album cover, which I was given as security from a friend who needed a fast $100.00 loan! I never asked my friend how he got it, but I knew I had to enjoy the painting in “secrecy” for as long as it was in my possession! Then one day, about three years after John’s assasination, my now well-heeled friend who gave me this treasure in trust, offered to buy it back. Although I knew it must be worth upwards of a $100,000 dollars, I just asked him to return the hundred dollar loan I made him originally. To this day I wonder was that the right choice? Anyway, here’s a glimpse of this beautiful piece of art that hung for years in my office at Warner Brothers music. You can see it in the upper right half of the photo. The Naked Truth about John Lennon and Yoko Ono, And An Outraged Sissy Spacek! “Back in 1968, I was recording an album under the name Shadow Mann for the legendary Morris Levy. During the recording of one of my tracks, a cute little girl with a giant guitar case, walked into the control room. Ron Haffkine ( Dr. Hook and the Medicine Show), who was producing my album, jumped up, introduced himself…and then he introduced me as Shadow Mann. He got our engineer, Brooks Arthur, to play the track back as I danced around the studio. Sissy and I hung out over the next few months. She played me and Ronnie quite a few songs she had written, on a guitar that was almost as big as she was…but we didn’t hear that special song that could make her a star. Just before I left on a trip to California, a couple of free-lance writers Ron and John, (whose last names I don’t remember) brought a song to me that was a comment on the controversial John Lennon and Yoko naked LP album cover of “Two Virgins”. I suggested A few lyric changes and flew off to California for 10 days. When I returned I was surprised that my partner, Kelli Ross, had signed Sissy to our record label and Ronnie Haffkine had started making plans to record her on the song, “John, You Went Too Far This Time!”, by the two writers who finished the song in my absence! After I heard her sing it, I knew why everyone was so excited! Tags: "Sissy Spacek Video "John You Went Too Far This Time"